If we all live long enough, we’ll develop arthritis. The same can be said for our dogs and cats. But can you imagine developing arthritis as a toddler? 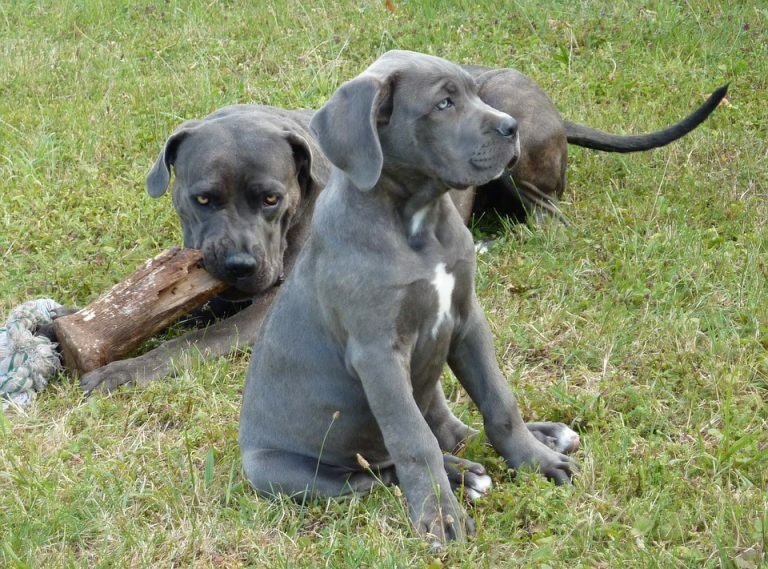 Unfortunately, our furry companions may be born with hip condition called hip dysplasia. This orthopedic problem is characterized by abnormal joint laxity that ultimately induces arthritis and causes pain. This is a relatively common condition, so I wanted to dedicate time this week to sharing information about it. Happy reading! Hip Dysplasia – What is it? To understand hip dysplasia, one needs to have a basic understanding of the coxofemoral joint, more commonly called the hip joint. This joint is like a ball and socket. The socket is a part of the pelvis called the acetabulum. The ball is the head of the femur or thigh bone. The joint is further supported by a joint capsule, as well as the round ligament (aka ligament of the head of the femur, foveal ligament), and hip muscles. The normal anatomy of a dog/cat hip joint. Illustration courtesy of www.doghealth.com. The development of this condition is affected by a variety of factors, particularly nutrition, growth rate, environment & exercise, muscle mass, and hormones. The cumulative result is initially joint laxity – the ball moves around too much in the socket. 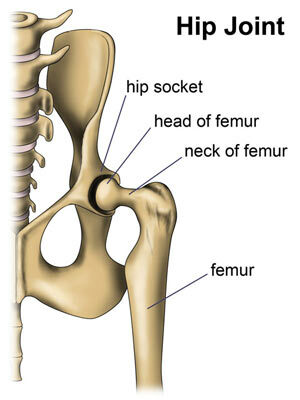 The socket then becomes shallow and the femoral head flattens. The joint fills with an excessive volume of fluid and the round ligament swells and can rupture. Ultimately, the joint loses stability, articular cartilage erodes, and boney changes occur. Hip dysplasia causes initial joint laxity that ultimately causes joint damage and pain. Illustration courtesy of the American College of Veterinary Surgeons. Hip Dysplasia – What does it look like? There is no known gender predisposition, and clinical signs may be observed as early as approximately six months of age. Affected dogs typically have an abnormal pelvic limb gait, but the degree of lameness is quite variable. Some dogs only have intermittent gait abnormalities while others show non-weight bearing lameness. Many bunny-hop or have swaying hips when they run. Lameness is often worse after exercising. Dogs with hip dysplasia lose muscle mass on their pelvic limbs, and they are not able to flex or extend their hips normally. Hip Dysplasia – How it is diagnosed? Veterinarians will perform a complete physical examination, including attempting to move the hip joints through normal range of motion. As mentioned earlier, normal motion is typically markedly reduced, and often crepitus – a grating sensation produced by friction between bone and cartilage – is noted. 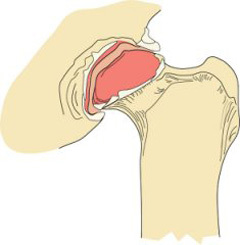 The doctor will perform a unique manipulation of this hip joint called the Ortolani palpation method; a positive result indicating excessive joint laxity is called an Ortolani sign, and it is a reliable indicator of hip dysplasia after approximately four months of age. 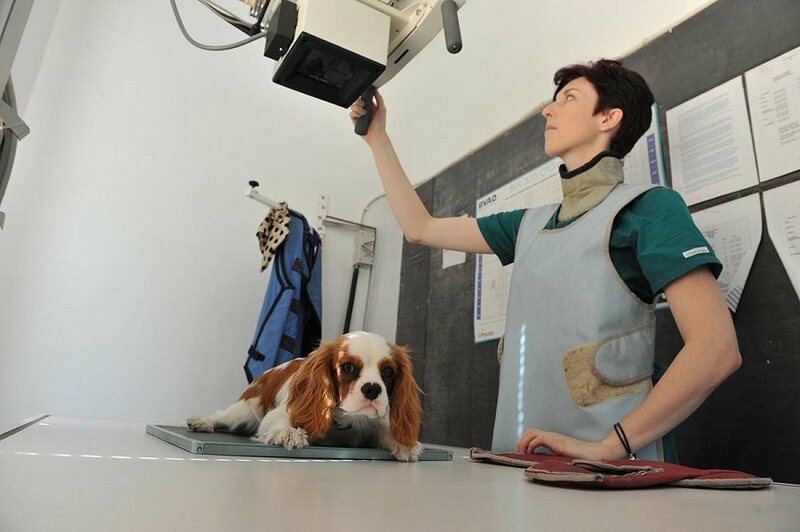 A veterinary nurse prepares to take radiographs. Photo courtesy of the Happy Pooch. PennHip – The Pennsylvania Hip Improvement Program is considered by many to be the best clinical predictor of hip dysplasia, and may be done in dogs as young as four months. 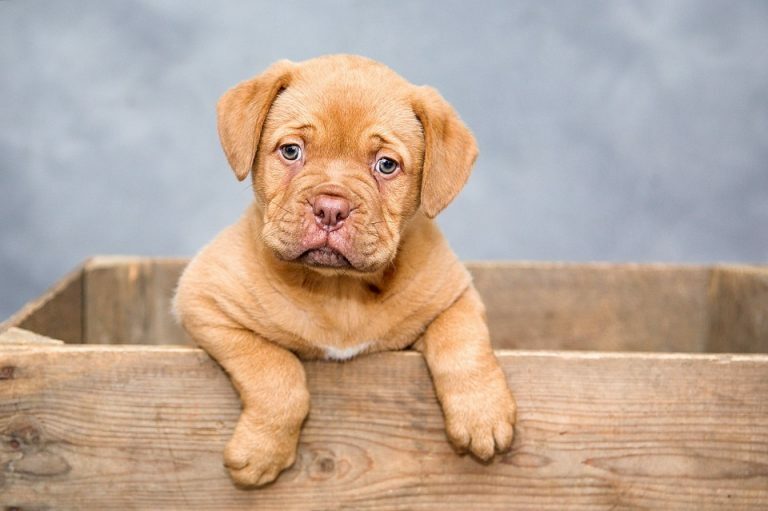 Dog parents may find it very helpful to partner with both their family veterinarian and a board-certified veterinary surgeon to ensure a proper diagnosis is made. Hip Dysplasia – How is it treated? Pet parents are strongly encouraged to partner with a board-certified veterinary surgeon to discuss the most appropriate surgery for their dog. Hip dysplasia in dogs and cats is a condition characterized by instability of the hip joints that ultimately causes dysfunction, joint damage, and discomfort. Veterinarians are able to make a definitive diagnosis through a combination of compatible clinical signs and minimally non-invasive diagnostic imaging. Multimodal medical management can be successful, but those who don’t respond adequately often benefit from surgery. To find a board-certified sports medicine and rehabilitation specialist, please visit the American College of Veterinary Sports Medicine and Rehabilitation.